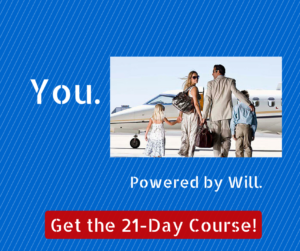 Breakthrough method helps you develop your Willpower in just 3 minutes a day! Chances are very good that you have seen a glimpse of what your life could be – that explains why you are striving in the direction of your dreams. Even as you ask yourself this question, you know the answer. It is not in a lottery ticket, or a lucky break – you know the answer is not outside of you. You know the means to achieving your vision lies within you. You know there is some power, already inside of you, that when developed, will carry you effortlessly to your goal. Indeed, it will seem as if you were teleported across the vast desert that seems to separate where you are today to where you want to be tomorrow. That power – that answer – is the Power of Will. And you know this because there are already many instances in your life where you have used your Will – to overcome obstacles, to achieve what you already enjoy, perhaps to win the heart of the one you love, or keep your family safe. And as you think of those moments, when you exerted your Will to do something extraordinary -I am sure you will agree that there is nothing else like that feeling of pure power that comes when you are pure energy in action, when nothing can stand in your way and you literally see your intention made manifest. Yes, experiencing the power of your Will is a glorious thing. And now I hope you see the answer you have been searching for. That you can harness your Power of Will – cultivate it, use it, strengthen it – each and every day – and that is the engine that is going to drive you to your dreams. One of the most overlooked facts about developing the Will is how simple – and easy – it can be. All you have to do to begin is think about your Will. Acknowledge that you have Will. That you have used it in the past. That you can strengthen it like a muscle. And then, after spending just a few minutes in this daily mental exercise, all you have to do is act. Act with the total focus of a committed Will. Act as if your result is already yours. Act briskly, and with confidence. And then when you are enjoying your rewards, consider how you used your Will to make them real. It really is that simple. Of course, you know the rest – that if you really are committed to developing your Will – if you really want to make your dreams a reality – you have to work at developing your Will every day. A Power of Will workbook, with enough space for you to write about what your Will means to you (including how you are going to act on it every day!). 21 MP3 messages for you to listen to daily. A 21-day email sequence that arrives at 6 a.m. to turbocharge your day. Daily contemplation of your Will. We can help you with the mental part of your game – especially the need for consistency, which is why we have set this program up to email daily. And getting these emails means you will have already signaled to that slumbering giant within you, that yes, this time I am serious, I am going to make this happen. And all you have to do is spend three minutes with each daily topic, and then act. And then repeat the process. After 21 days, you might even find yourself living in the reality that used to be a mirage. But only if you begin, today. 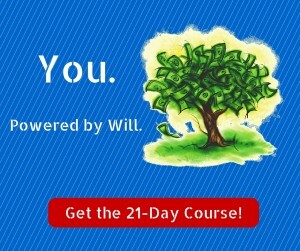 Follow this link to start your Power of Will 21-Day course, or click on the button below. P.S. Remember, you are the only person who is capable of developing your Power of Will. That is a choice only you can make.